In Colorado, you can pan for gold without a permit at Arapahoe Bar (Golden, Colorado), Cache Creek (near Granite Colorado), in Clear Creek Canyon Park (Evergreen, Colorado), Fairplay Prospecting Park (Fairplay, Colorado), and the Phoenix Gold Mine (Idaho Springs, Colorado). But the various gold rushes that formed the West really began long before the white man ever knew about the Americas. The various native empires formed elaborate trades routes of gold exotic animals, and the famed Spanish treasure ships were only rich targets from the gold they were able to nab. No mining required. Those empires and cultures formed the Indian nations that dictated the actions of white men. As well as dictating the taste for gold that drove thousands of prospectors from the east coast to the untamed lands. In the early 1800s, people began discovering gold around Denver. Zebulon Pike, well-known explorer, heard reports of gold strikes in Park County, Colorado in 1807. Things really kicked off with a discovery in 1858. Prospectors began chasing those veins to the source in the mountains west of Denver, then followed the Colorado Mineral Belt in a southwest direction all the way across to the San Juan Mountains. 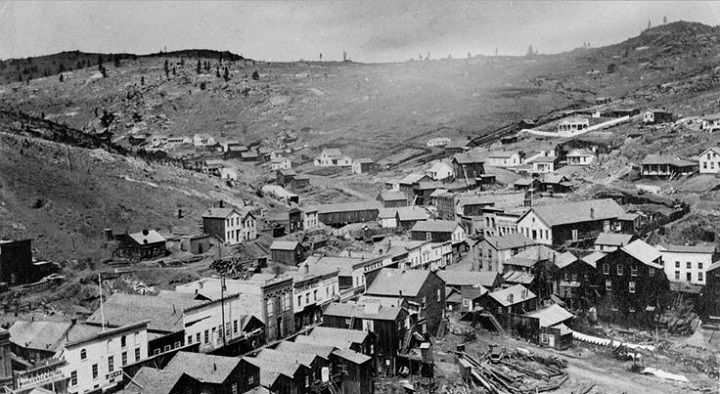 Cripple Creek, one of the last gold districts discovered, is currently still in production. There was the Pikes Peak Gold Rush, the discoveries at Idaho Springs, Breckenridge, South Park, Leadville, Summitville, Telluride, and Cripple Creek. Colorado gold production peaked in 1900 when 1,400,000 ounces were mined. Men of all walks of life chose to leave behind everything they knew and chase gold-lined dreams out in the Colorado mountains. Some of them stayed, some of them moved on to richer fields in Nevada and California, and some of them turned to the other occupations that opened up. You see, what really enriched Colorado wasn’t the gold: it was all the infrastructure that followed the prospectors and stayed even after the gold claims dried up. Prospectors turned into builders and cowboys, shop-owners and ranchers. Gold plots became pastureland. Even so, the crazy stories of those lawless days of violent men live on in legend. There are still rumors of the lost loads of gold, buried claims, and rich yellow veins running through Rocky Mountain Quartz. Sure, it’s widely acknowledged that the wealth of Colorado now lies in pristine snowfields and cool mountain getaways (have you booked your summer stay at Latigo, yet? ), but even we have a local legend of lost gold. Nearly 150 years ago, an old trapper by the name of Hill was camped near the head of Morrison creek and accidentally stumbled into an immense free gold ledge which cropped up for some distance from the surface of the ground. He took some specimens when he hiked out that fall, moved to the Blue River where he got sick, and died. He tried to describe the location from his deathbed, but his description was simply too vague for his friends, and they were unable to find it. However, this tall tale might have had some truth to it, since during General Bela M. Hughes use of the Gore Pass during his search for a shortcut from Denver to Salt Lake, young Lem Pollard (who eventually became the county clerk for Grand County), saw a shelf of rock and took a specimen. He treasured it for years and eventually learned that it was extremely rich in gold. He spent years looking for the treasure trove, but he never did find it. Even older reports indicated that the Ute Indians of the area traded rock from the Gore area for sugar, coffee, and tobacco, though that was likely quarry rock and not 'lousy with gold' as the lost load of the Gore suggests. Nevertheless, they were the same Ute Indians who carved into the aspens above Barber Basin (which we clear every year during our Round Up Week) and left arrowheads on a few of our horse trails. That gold ledge has been lost and found a few times over the years. It is no doubt within riding distance of Latigo... but all you have to do is come when the leaves turn in September, and you’ll see gold decorating the aspen leaves (no mining necessary). And it is worth so much more to us than anything that we could dig up and sell. The wealth of living here is the land, the lifestyle, the neighbors, horses, cattle, and the time available to us. It is waking up in the cool dawn with a hot cup of coffee while the rising sun turns the whole meadow to gold and knowing that we’re in God’s country. We are the best the West has to offer. And... if you keep your eyes wide open while you’re here... you might just catch a glimpse of a truly invaluable experience. So what are you waiting for? Latigo is waiting for you.